Hi Guys todays recipe will not be here as I am guest posting at Kawaling Pinoy but before you go ahead let me tell you something about that beautiful blog. Lalaine who is the person behind Kawaling Pinoy is one of the newest bloggers I met in this blogosphere and I am glad I did as there are very few Filipino food bloggers that makes really great dishes at the same time constantly shares beautiful posts. I know you might have read and visited several Filipino blogs but there are a few that stands out in terms of how they carefully present their dishes. There are few of them that excel in this regard and since that is the case I guess you know who they all are as their photos really stand out from the crowd, Lalaine is one of them. I love Filipino food and I love sharing them to everyone specifically to non-Filipino’s hence I blog and love blogs like Kawaling Pinoy as they market the Filipino cuisine appropriately by presenting them beautifully. Bloggers like them have to be commended for their great efforts as we just don’t just post for the sake of earning, site traffic and/or popularity but they are properly representing our culture, our tradition and how amazing the Filipino food are. Having said that we are not just confined to our local dishes but we do also sometimes share dishes from other cuisine. For my guest post since Kawaling Pinoy and Ang Sarap had already posted lots of Filipino dishes, we wanted to avoid reposting or duplicating what we already made so instead of sharing a Filipino recipe we will make some Japanese today. 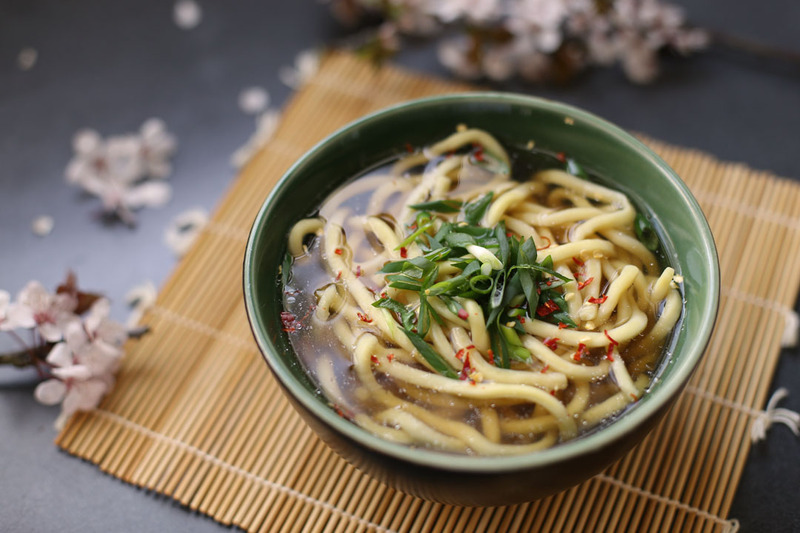 You can always refer to Filipino recipes on both our sites if really needed but for now let’s make some Udon soup, now you can head over there check out the recipe or continue below. Udon soup is a Japanese dish made out of udon noodles served in a soup stock with other ingredients such as meat or vegetables. Preparation of this dish can be varied from something really simple to a very complex and fancy dish. The noodle used is a thick wheat based noodles that can either be round or flat in shape and once cooked it will further increase in size. The most basic and traditional way of preparing udon it Kake udon where noodles are served in a simple soup stock called kakejiru. Kakejiru is a mixture of three of the most common ingredient in the Japanese cuisine the soy sauce, mirin, and dashi. A very potent combination as it packs a lot of umami hence it is used in most soup stocks in Japan. From this basic dish you can then further expand by adding tempura, karaage, fish cakes, etc, the choice is limitless. In a pot combine dashi, soy sauce, mirin, sake and salt bring to a boil then reduce to simmering heat, cook for 3 minutes. Place udon in bowls then ladle hot soup into the bowls. Top with spring onions and shichimi togarashi. 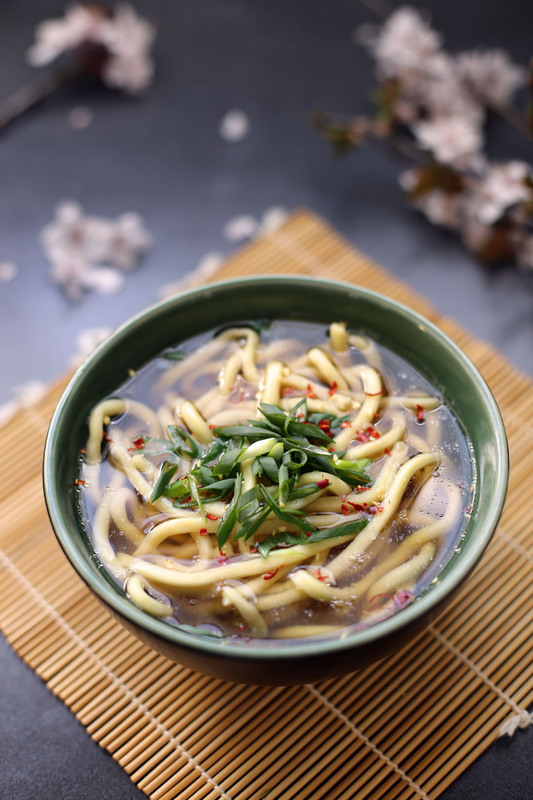 The bowl of udon looks so comforting and delicious! Thanks for the blog suggestion, I love finding new and delicious blogs. It depends on how strong the soup base is, different brands have different intensity. Sometimes I make my own stock sometimes I use the powdered ones.